We are creatures of habit, aren’t we? There are things that we do every day that we probably don’t even notice we are doing because they have become habitual. Taking shoes off when you come in the house. Hanging the keys by the door. Leaving your socks in the middle of the hallway so your mom has to pick them up. These are things that just happen without even giving them a thought. So when something is out of whack, we notice!! When your favorite takeout place changes their french fry distributor, it’s unsettling. When your iOS platform updates, it can be downright aggravating. And when a resident in your building, whose name you don’t even know, walks out of the building without his banana, you can barely cope?! No, seriously. Living in New York City, we are sardined together in these big buildings and we can ride an elevator with someone for years and never utter a word, but still, we know them. So one of the residents in my building has a banana thing. He’s gotta be at least 6’4 and lanky, but marathon runner lanky, so he’s super fit. I’m not sure how many times a week I see him because we are on similar schedules. Me, bleary eyed, barely dressed in presentable clothing, being dragged out by my furry four-legged kid at the crack of dawn. Him, impeccably dressed, clearly showered and coiffed, and finishing a banana. Every time I see him. Imagine how I felt the other morning when I noticed the hand that is usually armed with yellow sustenance, was awkwardly placed against his chest as he walked out the building, empty. “Banana Man” had no banana!!! I know at this point you’re thinking I’ve totally lost it, but I assure you I haven’t. Because when I walked in to the lobby and remarked to the doorman that the resident had no banana, the doorman immediately responded “I know, right? He must be missing it.” Maybe we’re all a little nuts, or maybe it’s just that we are creatures of habit? Either way, I like things to be the way they I expect them to be and if they aren’t, I at least want to know why. So next time I see “Banana Man”, if he has no banana, I will boldly inquire! Do you have any sort of habit or ritual that you engage in every day? I don’t mean the standard stuff of brushing your teeth, but if when you brush your teeth, you sway back and forth to the tune of Barry Manilow’s feel-good hit “Can’t Smile Without You”, I would love to hear about it! It only takes a second….. There I was heading out of a building, when I noticed a woman also heading towards the exit. It was one of those double door situations where you actually had to exit twice, ok? So I held open the first door for her and let her exit first, me following out behind her. Nothing. Not a smile. Not a nod. Nothing. She reached the second exit door ahead of me and pushed through it. I, being younger, more agile and way prettier (that’s important), was right behind her and loudly said “Thank you” as exited I the still opened door. I suspect if I hadn’t been fast enough, she would have let the door slam in my face. She didn’t even blink at my “thank you” which made me even more annoyed. Sure, I can have compassion and think that maybe she was just having a bad day, but seriously, it only takes a second! Thank you! Please! One second. I timed it!!! It’s true!! So I don’t care if you are having a really crappy day, you assuredly have one second to be courteous to another human being. Try it!! Oh, and give it as a gift. Meaning don’t be attached to their response, as you may not get a “Thank you” or a “You’re welcome” but at least you’ll walk away knowing you’re not an a*@hole! There’s more to #givingTuesday than cash! First, there was Black Friday, then Small Business Saturday, Cyber Monday, and now, Giving Tuesday. All of these “days” are centered around money. Black Friday has everything on super sale after Thanksgiving, so you’re encouraged to buy, buy, buy. Small Business Saturday is all about supporting small businesses (duh), so buy, buy, buy! Cyber Monday means you can sit in your PJ’s and what else? Buy, buy, buy! Now we come to Giving Tuesday, which encourages you to take any money you might have leftover and donate, donate, donate. It’s a grand idea and there are countless worthy organizations that need support by way of donations. I know I have several that I support year-round, but there may be a new one or two that I help out this year. (If you’re looking for some ideas, shoot me an email at julie@totemtamers.com, and I’ll happily share some needy organizations with you!) Over the last couple days though, something occurred to me, there is plenty of giving that doesn’t actually require spending! You can certainly give time, like my family did on Thanksgiving when we served dinner at a homeless shelter run by The Doe Fund. Giving can be as simple as a smile to a neighbor, or an extra hug to your kids. I had a birthday over the weekend and so many people gave me time and well wishes that it moved me to tears. Giving feels good and it works in both directions! The giver and the receiver end up rewarded, and there’s no better gift than that! So, if you have some spare change and/or a cause near and dear, go ahead and make a donation. If you don’t have money to spare, that’s ok, because you definitely have spirit and good will in abundance, and that’s free! Use it! I think you’re awesome and you will too, when you give. #tbt, only about an hour ago, but it counts. Or, what I did with my anger. There I was, innocently walking along on my way to yoga this morning. It was one of those mornings where I would have much rather stayed in bed a little longer, but I knew that going to class and sweating my patootie (yes, that’s a word) off, would certainly wake me up and ready me for the day ahead. There’s this one intersection in my neighborhood, that no one gets right. From the pedestrians to the cars, there’s always someone in the crosswalk that shouldn’t be. I am cognizant of this every time I cross, whether on foot or on wheels, but I will happily defend my position if I have the right of way. 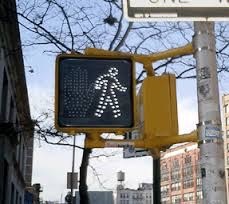 So, back to me blissfully walking with my yoga mat, frozen water bottles, etc., when I approach the intersection and see that I have the right of way, at least according to the little walking man sign! Clearly my turn to walk! Well the cabby who almost ran me over, either didn’t see the sign, or more likely, didn’t care. His window was wide open, practically begging for me to yell an obscenity and let him have it, while staking my claim as a pedestrian. But something so strange happened, when I opened my mouth to let out a tirade, nothing came out! It was an anomaly to be sure, because I am never (rarely) at a loss for words, especially colorful ones that have four letters! I continued on in silence, with my anger quickly being replaced by an almost nervous giggle. I didn’t yell. I didn’t give rise to the blood pressure that had bubbled to the surface. I didn’t allow my anger to take over and potentially effect the rest of my morning. Brilliant!! This was big of course, and I spent a portion of yoga contemplating what it might have felt like to give voice to that anger, and guess what, I couldn’t come up with anything positive! Now, don’t get me wrong, I’m not suggesting bottling up your anger, or not finding some sort of release for it, but I am suggesting it be situational, perhaps. Me yelling at that cab driver for having blatant disregard for pedestrians crossing the street would have accomplished nothing. The cab driver wouldn’t have cared, and might have even gotten mad himself and yelled back at me, or taken it out on his next fare, or worse, might have gotten distracted enough to hit someone or something. Any of those things might have happened, and nowhere in there is the option of the cab driver apologizing to me for almost ruining my morning. What would have happened to me had I yelled? Well, my blood pressure surely would have gone up and stayed up, and that’s not a great thing. My mindset would have been darkened and that’s not a good thing. I might have been further distracted in yoga class, in a negative way, that might have led me to go into a posture improperly and hurt myself. See, nothing positive would have come out of my 15 second explosion, but everything positive came out of my holding on to that 15 seconds. All that being said, what am I really saying? Hold on to your anger when possible, because there can only be positive reactions when you do, and when or if you can’t hold on to it, be swift about it and release it as quickly as you can. Then you can go on looking at silly #tbt pictures of you when you had that mullet in high school. Yeah, I saw them. Hilarious. Totem Tamers instills the concept of recognizing your emotions, and then you can move through them. That’s the visualization and deep breathing techniques we share in our beautifully illustrated booklet or our handy pocket card. Get yours today when you order a Totem! Just click on the Totem of your choice on the side of the page, and get on with being calm.